Vice president-elect M. Venkaiah Naidu said he will uphold the dignity and decorum of the vice presidential institution. 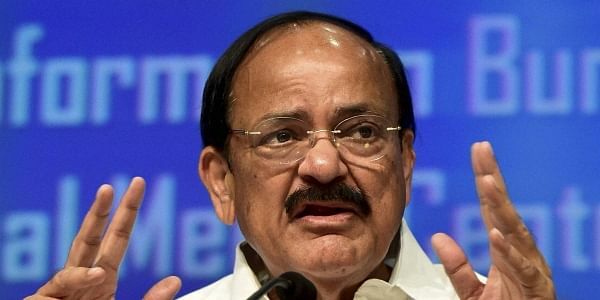 TIRUPATI: Vice president-elect M. Venkaiah Naidu on Monday said he will uphold the dignity and decorum of the vice presidential institution, as his appointment speaks the beauty of the Indian parliamentary democracy. After offering prayers to Lord Venkateswara here, the Vice President-elect said he is grateful to the Members of Parliament belonging to different political parties who in an overwhelming manner have supported his candidature cutting across party line. “Now I am not a BJP man, I do not run to any political party. I have resigned from the Ministry and from the party and in two three days I will resign as the Member of Parliament. Elected to this post I must be independent and must uphold the dignity and decorum of the institution. It is all the love and affection of the people of India and affection of Narendra Modi and also the various party members,” he added. Stating that his visit to the temple was completely apolitical, Naidu stated that today marks a new chapter in his life. “This is my responsibility and I will do my best…This is my responsibility and I will do my best. This is all happening because of the blessing of lord Venkateshwara. I feel very inspired whenever I come here. Today onwards I am going to open a new chapter in my life. This is totally apolitical. I feel early blessed that coming from a humble agricultural background I have been able to be in this position,” he said. Naidu secured 516 votes as against 244 got by Opposition candidate Gopalkrishna Gandhi. In all, 771 out of 785 MPs cast their votes. Votes of 11 MPs were, however, declared invalid. Fourteen MPs of different political parties did not vote due to varied reasons. Naidu will take oath of his office on August 11. The term of incumbent Hamid Ansari will come to an end on August 10. Ansari held the position for two consecutive terms during (2007-2017).